Looks like a night out on the town to me, the perfect time for a glass of BUBBLY. This card can easily be used for a new job, birthday, anniversary...almost any occasion! When stamping a CAS design, try keeping your images and embellishments to 1/3 of your card. This helps build a focal point and keeps plenty of white space. Adding small embellishments, like the Gold Sequin Stars I've used here, is a nice way to add detail without taking away from the overall design! How are you inspired by BUBBLY? Love the simple colour scheme - black and white and sparkle! Perfect for the Cue Card! I'm so glad you were able to use this card!!! :) It's a perfect New Year's card and fits is perfectly with this week's bubbly challenge! The colors on this are so elegant and perfect for the celebration!!! 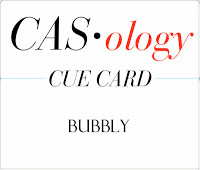 A beautiful, elegant card that definitely says celebration to me and bubbly is a great way to celebrate! It is never too late for a beautiful card like this. I love how you used that wonderful skyline and anchored it with a strip of glitter. LOVE the glitz strip and the stars!! Dreamy card, and LOVE the bold black in it, a FAVE of mine for sure!!! Love this little city scape Maureen and your strip of sparkle is a pretty touch!! Yup - definitely looks like a bubbly kind of night in the city! :D Love the glitter strip and tiny stars! Oh, if I could tell you how many times I have done the same thing! ;) Love your card and it fits perfectly! Fabulous take of the cue word Maureen! Love the gold glitter strip! 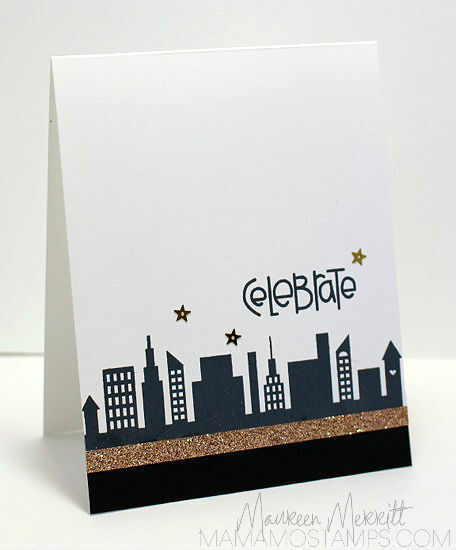 Awesome card - love the silhouette city and the strip of glitter! Maureen, nothing says "celebrate" like a little bubbly! Super silhouette card...love this! !